Oh man! True Blood! I am such a huge fan! This season I finally had some other friends who were hooked, as well, so when the season finale rolled around it was time for a party! We had so much fun decorating and making everything for the party…but of course as you can guess my favorite were the cupcakes! 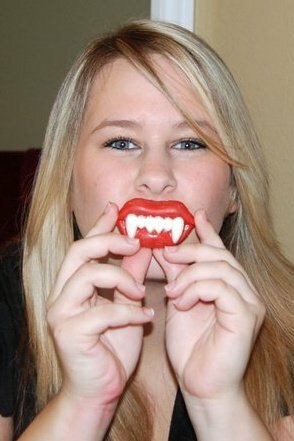 Mainly because they had those awesome red lips and fangs…which I used in just about every picture that night. And in case you are wondering, if I was on the show I would be a vampire (because I’m sorry, but everything else is not half as cool) and I would be dating Eric and Alcide…because I could never choose between that amount of hotness. And I would be best friends with Lafayette…”Hookah”! I won’t go into detail with the season finale because I do not want to ruin it for anyone…but I will say I am very pleased with how it ended since I am over Bill! As for the cupcakes, they are Red Velvet with a delicious Cream Cheese Frosting. And the Candy Lips are a mold from Wilton that I found at Michael’s. And the bite marks were done with a gel decorating tube. These cupcakes are my favorite Red Velvet recipe ever. The flavor was by far the best! I found the recipe on The Way The Cookie Crumbles, so glad she did such a great comparison! Sift together flour, sugar, baking soda, cocoa, and salt into a medium bowl. Beat eggs, oil, buttermilk, food coloring, vanilla, and vinegar in a large bowl with an electric mixer until well combined. Add dry ingredients and beat until smooth, about 2 minutes. Divide batter evenly among lined cups, filling each three-quarters full. Bake until a cake tester inserted in centers comes out clean, about 17 minutes. Transfer tins to wire racks to cool 10 minutes; turn out cupcakes onto racks and let cool completely. Frost as desired. Beat cream cheese, butter, and vanilla together in a large bowl with an electric mixer until combined. Add sugar and beat until frosting is light and fluffy, 5-7 minutes. Frost cupcakes using your favorite tip and chill for 2 hours to set frosting. Hey there Jessica 🙂 I’ve just been giggling my way through reading this, lots of fun. Bye for now, I’m off to read some more. Oh yeah.., thanks for visiting my blog & saying hi. I’m guessing I’ll be popping on over regularly, so looking forward to get to know you more. What an adorable idea! Red velvet is so, well RED, and so retro-Southern…so perfect for True Blood! Wow, these are SO cool!!! I love the lips and fangs. Perfect cupcakes for True Blood….which had an oddly unsatisfying ending. (I’ve never been a Bill fan.) These cupcakes would help get over the seasons’ last episode! I’ve seen red velvet recipes before, but still haven’t made them. I’m a huge true blood fan as well!! While I am a Bill fan, I also can’t deny the Eric and Alcide deliciousness factor. On to the cupcakes- adorable! I’ll be on the lookout for the mold! Oh man, I love me some red velvet! And heck yes, I was drooling when Alcide showed up. Major hotness! Those cupcakes are awesome! 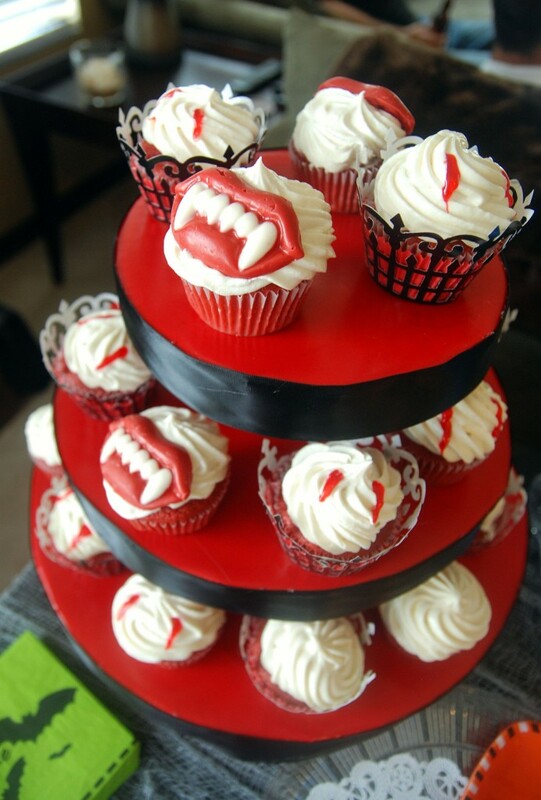 I love red velvet and the fangs are the perfect touch (I know what I’ll take to the annual Halloween party this year!). HUGE True Blood fan, even though we don’t have cable so Lalaalalala… I have no idea what’s happened this season, I have to wait for Netflix or something! Even though the fake southern accents annoy me sometimes, it’s a fun show. I am def. not a fan of the ‘sensitive’ vampire thing… Eric all the way! Those cupcakes are hilarious! And I love those special wrappers! I don’t have HBO so haven’t gotten into the true blood thing, but I have thoroughly enjoyed those twilight movies… How did you find my blog Jessica?? LOVE True Blood!! Totally agree about Eric and Alcide, such yummy hotness! And oh “hookah” we would be such awesome friends! Thank you for sharing the recipe, the last couple I’ve tried have not been so good. Girl that is just too much! Cute! OMG, these cupcakes are so much fun! I haven’t gotten into True Blood yet, but I have heard that I should. I am admittedly a Twilight fan, though, and I do agree that vampires are pretty awesome. I have a red velvet cupcake recipe that I plan on making in the near future myself! 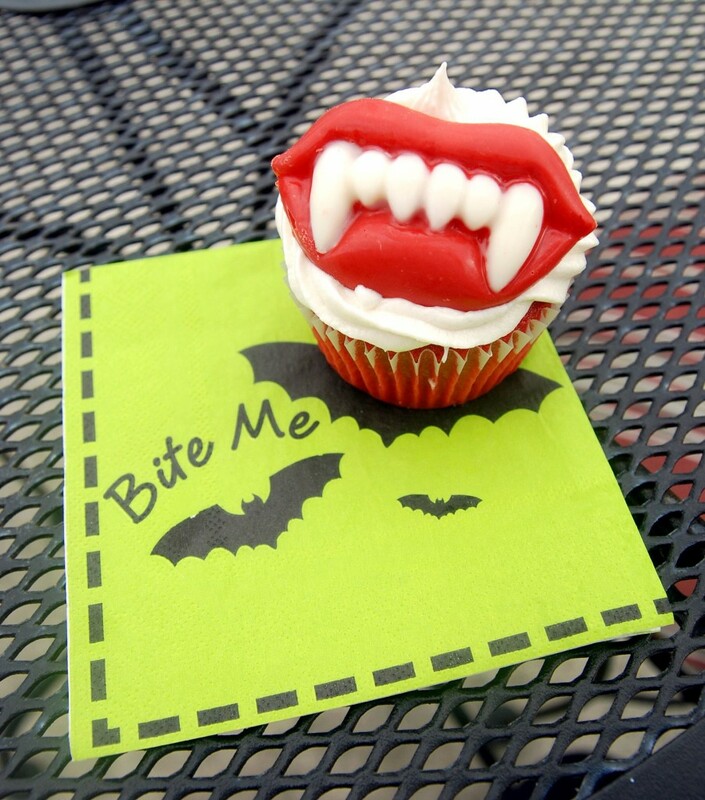 Your cupcakes would also be a fantastic idea for a Halloween party! These are so much fun! And of course, they look super delish. I have made Red Velvet for years from a clipping out of a Better Homes & G mag from the 60’s put out by McCormicks. I bake in volume now, so I use Duncan Hines Premium Red Velvet Mix in case someone needs a quick Treat. Loved your little story! Oh my! These made me giggle. They’re great. At first I thought it was a type of Rocky Horror mouth, but then I read on. Great post! I’m so glad you liked this recipe. I’m such a red velvet lover and PICKY about it. Yours turned out adorable! Haha, these are so cute!! 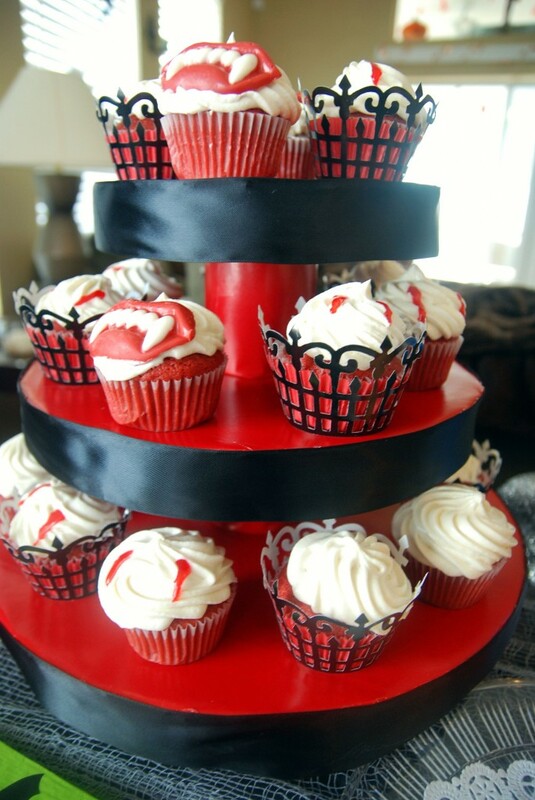 I’m not much of a True Blood fan but these cupcakes are just adorable! Love these! What a great idea, they’re so perfect for Halloween! *gasp* I LOVE these cupcakes! I need to find that mold and make the lips & fangs candy. They are so super cute! Ahh, these are hilarious! My sister in law is nuts for the show, and I think she’d love these. I can’t possibly think of any way to mail them across the country to her, though! Thanks for sharing these, Jessica. You have some lucky friends! Pingback: Snapshot Saturday: Sis's Bridal Shower | Pass The Sushi! Pingback: Red Velvet Cupcakes | Pass The Sushi! Hi Jessica, can I use this recipe as is and make a cake? What adjustments should I make to cooking time? I just made your Red velvet Cupcakes last night for Valentines Day…so moist and yummy! So I decorated it with Red little hearts, We LOVE …LOVE them!! Thanks Jessica! !